During the last week of June, Angie, one of my team members, forwarded me some information about a free service for publishing e-books across various platforms. The catch: you had to upload the book by the 4th of July. For an afternoon, I became a little bit crazed (yes, I’ll admit it), wondering if my team and I could write, edit, design, and publish an e-book in only a few days, while serving our clients. I brainstormed with Carrie, contacted John, my designer, and tweeted about it. Could I finish an e-book by July 4th? Should I try? Considering that I had already written much of the content previously, we decided to go for it. Then we read the fine print. The company didn’t really offer what we wanted for free, so the July 4th deadline disappeared, but my zeal to finish and publish quickly did not fade, thanks to Carrie’s pushing encouragement. So, here we are, July19th. I just sent edits to Margy, who will finish the edits, working from John’s beautiful design. Our plan/hope/expectation is that we will be ready to go on August 1st. 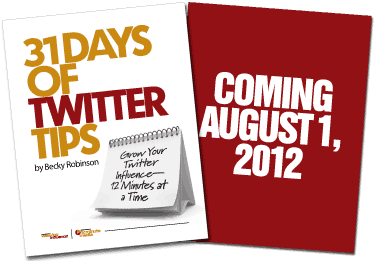 The e-book will be FREE for 31 days, available for download at 12minutemedia.com and on Kindle. We want to get it in the hands of as many people as possible. If you would like to help share, tweet, or review the e-book on your blog, I’d love to send you an advance copy in the next few days — as soon as these final edits are complete. We’ll also create some content to make it easy for you to share. If you’re interested, please email Angie at angie@weavinginfluence.com and we’ll send a PDF as soon as it’s ready. Thanks, Jo – much appreciated! I changed the email address. Have sent an email to Angie to say I’d definitely be interested in reading and publicizing this ebook. Look forward to getting some great tips!